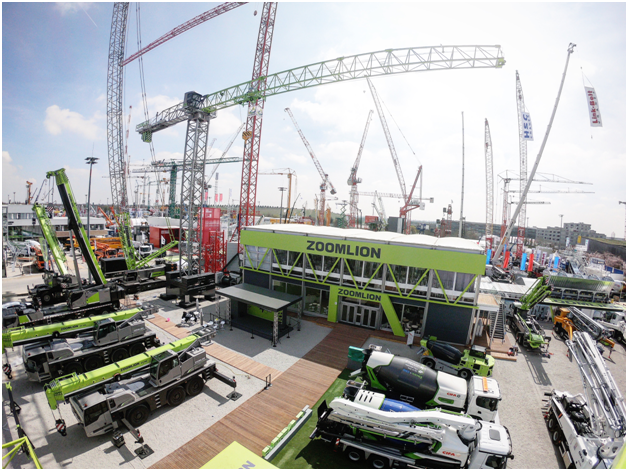 In the Zoomlion exhibition area, where green and intelligent design were combined, the area showcased high-end products including concrete machinery, engineering cranes, tower cranes, dry mortar equipment, aerial work platforms, and forklifts, etc..
More than 70% of the products on display were manufactured by Zoomlion's Localized European Company. They follow the European market's needs and preferences in terms of product performance, technological innovation and appearance. Zoomlion also showed off its unique innovative charm by utilizing new materials, energy saving, smart products,etc. Zoomlion's European branch, CIFA, m-tec and the newly joined WILBERT, also made their debut at the exhibition. Zoomlion's Italian branch, CIFA, is an established and world-renowned concrete machinery manufacturer. 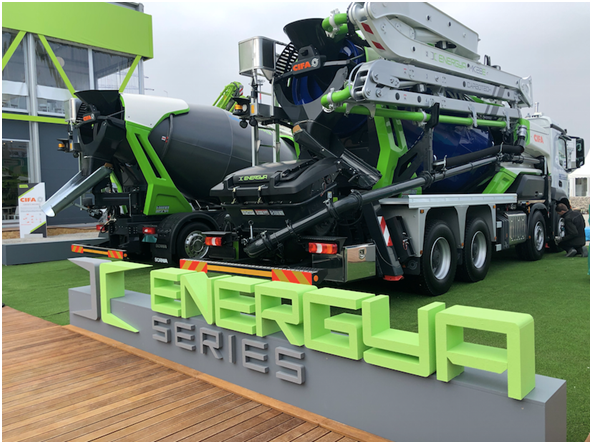 They highlighted a variety of products including their globally patented carbon fiber arm pump truck, plug-in hybrid truck mixer and plug-in hybrid truck mixer pump from the ENERGYA series, all of which are CIFA's localized manufactured stellar products. The MK28E plug-in hybrid truck mixer pump of the ENERGYA series is the world's first plug-in hybrid truck mixer pump. It was developed with industry-leading electric and diesel hybrid technology. It is a product that benchmarks the industry's sustainable development concept and it was well-received by the audience at the exhibition. The world leading dry-mix mortar manufacturer, M-tec , has unveiled 12 products. The products will provide customers from all over the world with professional equipment and solutions for dry mix production equipment, mixers, bulk silos and dry mix construction machinery. The first showing of the Duo-Mix Connect was developed specifically for "3D printing mortar".By using the Duo-Mix Connect to join the back-end robot with the 3D printing mortar, the quality of the mortar can be kept stable. Additionally, the construction speed can be precisely adjusted as needed, which ensures the mortar strength and adhesion of each layer. More than 10 countries have applied this technology to 3D printing mortar projects. This is likely why Zoomlion is a pioneer of industry development and technological trends. 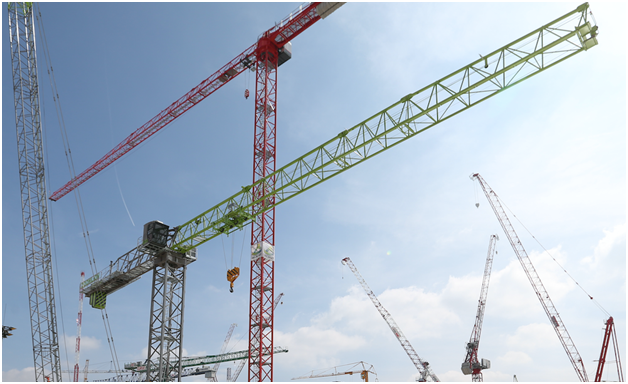 The WILBERT company, which recently joined Zoomlion, also exhibited the flat-top tower crane WT260. The lifting capacity, precision and safety of the WT260 are second-to-none throughout the world. In addition to European-made products, Zoomlion also carries a number of independently developed new-generation 4.0 series products，ZRT850 tire cranes (which is developed specially for oilfield projects and boast an excellent lifting performance), the flat-top tower crane T7020 (which has an adaptive configuration optimization ability and an excellent lifting capacity), and many other exceptional products. 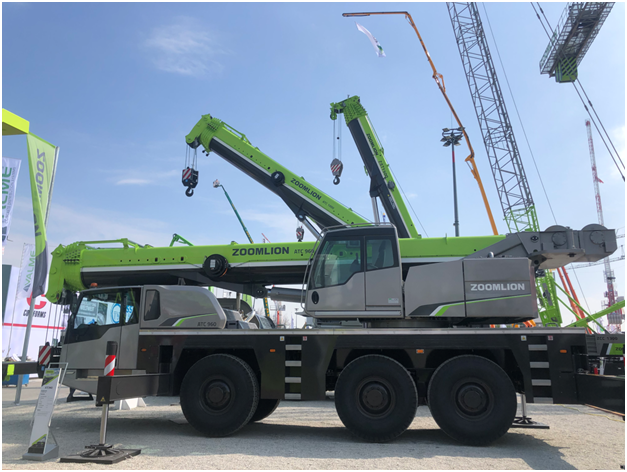 At the same time, the ATC series of all-terrain cranes that were jointly developed by Zoomlion's domestic team and CIFA, met with the customers for the first time at the exhibition. 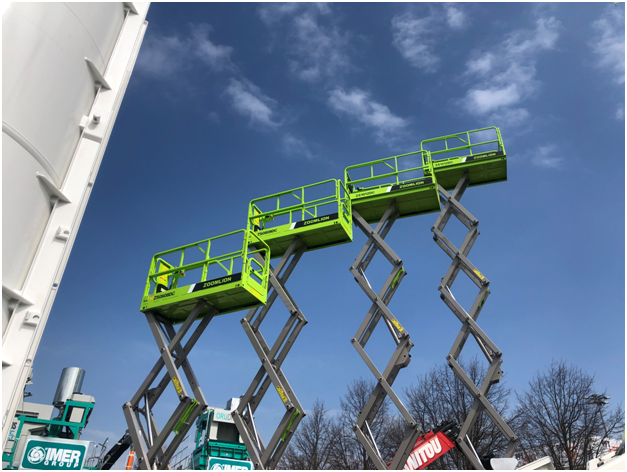 This exhibits also includes four scissor-type areial working platforms and four forklift products that are sustainable, smart and intelligent. Besides, the exhibition area also has the ZValley Booth. The ZValley-tailored intelligent remote monitoring and leasing management platform can be installed on the electric drive scissor-type lifting platform product series that was revealed at the exhibition. This allows it to remotely monitor equipment's conditions and information in real-time. The client can quickly complete positioning and monitoring, fault diagnosis, unlock machine operation, and support the management of contracting, finance and other leasing services. It will help leasing companies and users effectively improve equipment management and efficiency, reduce operating costs and improve operating turnover. In recent years, Zoomlion has actively promoted global business development. They expanded through their products, established sales and service platforms in 80 countries, opened up branches in more than 40 countries, and their services reached over 120 countries and regions. At the same time, throughout their 10 years of international development, Zoomlion acquired POWERMOLD from Britain, CIFA and LADURNER from Italy, m-tec and WILBERT from Germany, RAXTAR from the Netherlands, etc. to expand their international capital, culture, management, and production capacity. At the same time, Zoomlion has actively promoted overseas localized manufacturing, deepened its efforts in the European market, and practiced the consensus of “inclusiveness, rules, responsibility, co-creation and sharing”. They’ve coordinated development with European factories to form an overseas localized manufacturing hub and acquired companies while winning local community's acknowledgement through responsible actions. Zoomlion understands and accepts the contrasts between different cultures with an inclusive attitude. At the same time, it holds the right to influence action or decision, integrates mergers and acquisitions into the overall strategic management and control system, and coordinates all international activities as in "a game of chess". They seek common ground while accepting differences. After acquiring M-tec in 2014, Zoomlion has achieved significant resource advantages in the last five years, strengthening the technical integration and supply chain synergy between both parties. The m-tec global business compound growth rate has exceeded 33%. The merger between the two sides has rewritten the development pattern of the dry-mixed mortar industry. Zoomlion developed a large number of dry-mixed key components to achieve self-control, while reducing core costs by more than 40%. Advanced construction equipment and technology have been promoted around the world to achieve Zoomlion and M-tec's “one plus one is greater than two” effect. 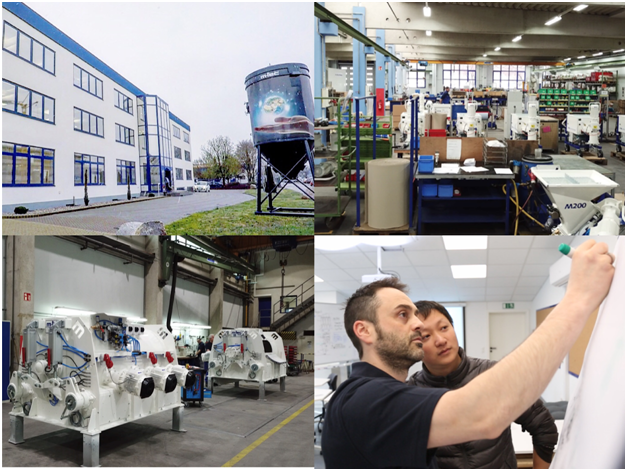 At the same time, Zoomlion has taken advantage of local conditions and has found its potential.After the acquisition of CIFA, Zoomlion tapped into its resources, extended its product and business chain, making it not only a product manufacturing base, but also Zoomlion's European research and development center, logistics center and global sourcing platform.Zoomlion's overseas sales team has worked with CIFA to expand to emerging markets such as Southeast Asia, Central Asia, Africa and the Middle East.Through innovative development, CIFA has gradually transformed its regionalized company, which is related to traditional concrete equipment, into a globalized company that realizes the local manufacturing of concrete machinery, engineering cranes and construction crane products, and radiates business in the Middle East and North America. Since the merger, the number of international distribution channels shared by both parties has increased by 32%.After the joint efforts of both parties, the sales revenue of CIFA's third-party markets other than Italy in 2018 increased by more than 30% compared to the pre-acquisition. At present, Zoomlion continues to deepen their “localization” overseas development strategy. 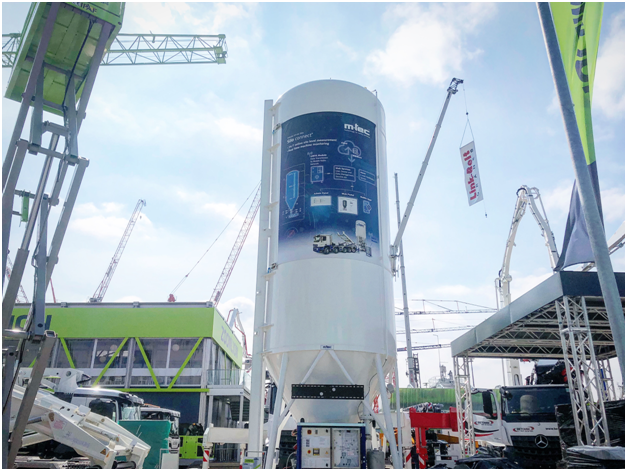 Zoomlion made its impressive appearance at Bauma 2019, not only was to show the new products and technologies to customers from around the world, but also show their vision of actively serving and integrating locally, working closely with global customers, creating value and building a better life. Regarding the basis of improving the global network, Zoomlion is pushing forward localization operations and localized manufacturing. 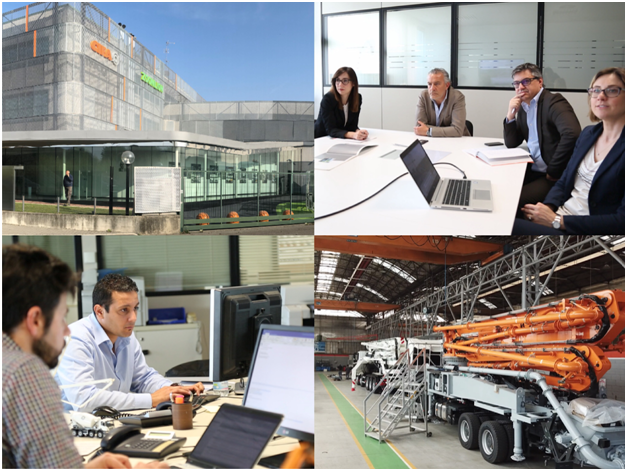 Zoomlion continues to deepen its localization in terms of personnel, finance, services and business operations of its overseas subsidiaries.The results in localized manufacturing are even more obvious. 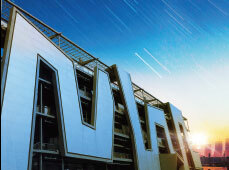 More than 70% of the products exhibited by the company at Bauma 2019 were manufactured by European localization companies. The development of “localization” is Zoomlion’s key to opening up the global market. Currently, the company has formed an overseas production base across Europe, Asia and the United States. It has deepened cooperation with global manufacturing bases, taking advantage of its research and development on localization, marketing and post-sales service networks. Zoomlion has combined the advantages of international supply chain resources to improve the global layout. Additionally, the company continues to upgrade their localized integrated business affairs, such as establishing overseas spare parts central warehouses, training centers, and maintenance centers, etc., and continues to expand overseas leasing and financing. Bauma 2019 was the best stage for Zoomlion to showcase integration of global innovation talent and to localize “Smart Products”.In the future, the company will also actively integrate into the globalized economy with an inclusive attitude while intensifying their role as a world citizen. They will work together with global customers to increase quality-of-life around the world.